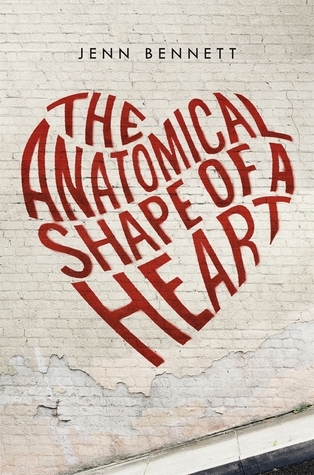 The Anatomical Shape of a Heart is a much needed addition to the young adult contemporary romance genre! I can honestly say I loved everything about this book. It was an adorable and meaningful romantic read. The characters and relationships in the book were phenomenal. A standout for me in the book was the family dynamic. I loved the relationship between Bex and her brother and mother. They were a fun and quirky group who always had each others backs and made it out of tough times together. Bex and her moms relationship was refreshing because her mom was a parental figure but she was also Bex's friend. I very much enjoyed how the world of art was brought into the story. Bex draws anatomical drawings and Jack is a graffiti artist. They both enjoyed art but it meant so much more to them. I loved getting to explore the art world but I also loved getting to see how these two characters were able to express themselves through their art. I do not want to give too much a way but you find this out earlier on so I think it is safe to mention it. A secondary character in the book deals with mental illness and it has a big impact on the other characters lives. I mention this because it means a lot to me when authors correctly depict mental illness and I think Jenn Bennett did a really good job of this. I saved the best part of the story for last, the romance. The romance in this book is what made this an outstanding read. The chemistry between Bex and Jack is instantaneous. They are great together. I loved their witty banter and jokes but they also were able to understand each others struggles and help one another through them. The relationship between them was also very realistic. The best word I can use to describe their romance is beyond adorable. They will have you smiling, cheering them on and making your heart beat faster. By the end of the book you will wish you had a Jack in your life (serious book boyfriend potential here!). This is a book I just cannot do justice in a review. You really have to read it to understand how phenomenal it really is. I highly recommend it to anybody who enjoys young adult contemporary. I ended up liking this one too! Great review!